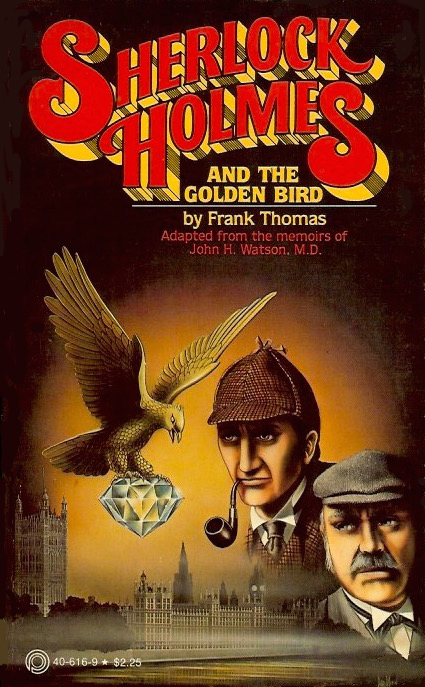 The first Holmes pastiche by the prolific Frank Thomas. This first paperback edition contains a preview for The Dossier of Solar Pons in the back. As the cold London fog rolls in off the Thames and Sherlock Holmes and the good doctor settle in for a quiet and cozy night by the fire, a letter arrives . . . .
And so begins a tale as incredible as any yet told–one in which we journey back in time with Sherlock Holmes and Dr. Watson as they stalk the pages of evil–from the decadent quarters of Soho to the exotic reaches of Constantinople, from the mysterious village of St. Aubrey to the familiar 221B Baker Street. Theirs is a strange search for a Golden Bird whose history is ancient, whose presence is illusive and whose secrets are both rich and deadly . . . .